Detectives from PSNI’s Criminal Investigation Branch have carried out 14 searches in the Belfast and Newtownabbey areas over the past two days in relation to ongoing investigations into criminal activity linked to North Belfast UVF. Three people were arrested under the Terrorism Act during the searches which took place in residential and commercial properties. Yesterday (Monday), a 56 year old woman and a 39 year old man were arrested in Newtownabbey on suspicion of terrorism offences. The 39 year old man was also arrested on suspicion of being a member of a proscribed organisation, namely the UVF. 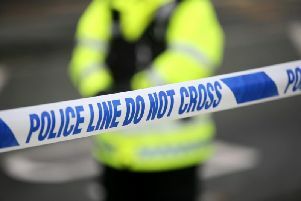 A 56 year old man was arrested in North Belfast yesterday on suspicion of terrorism offences. They are all currently being questioned at Musgrave Serious Crime Suite. Detective Inspector Heather Whoriskey said: “This two-day operation, involving around 100 officers, demonstrates the PSNI’s commitment to tackling all types of criminality linked to paramilitaries. “Seven properties were searched yesterday and a further six were searched today during which officers seized approximately £32,000 of cash, around 9,000 contraband cigarettes, imitation firearm, money lending ledgers, UVF paraphernalia including flags, fleeces, belt buckle and ties, computers and mobile phones. We also confiscated furniture, three vehicles and 24 airsoft rifles under the Proceeds of Crime Act. “While these searches and arrests focused specifically on the North Belfast UVF, we will continue to target all paramilitary groups and disrupt their illegal activities which only serve to blight the communities they operate in. “These people target the most vulnerable members of their communities – people who are struggling to make ends meet or perhaps those who have an addiction and need help. The stark reality is that they are not helping but instead exerting control and fear over them. “This is why we are committed to disrupting these types of criminal activities - including money lending, drugs and firearms offences, selling counterfeit goods as well as paramilitary style attacks - and the paramilitaries behind them. “These criminals are a blight on society and the communities they exert their control over. We are working hard to rid our communities of the paramilitary groupings but we need your help. Anyone with information should contact the PSNI on 101 or if you wish to remain anonymous please phone the Crimestoppers charity on 0800 555 111.